Game of Thrones Creator : HBO's Iron Throne "Not What I Want"
Game of Thrones creator George R.R. Martin doesn't think HBO's take on the Iron Throne is faithful to his book series. As any Song of Ice and Fire purist could tell you, there are a lot of things that HBO's Game of Thrones gets wrong. Some are things that can be justified by the limits of television. There are characters from the books that never make appearances, for instance, on account of there simply not being enough time to include every person ever introduced into the literary version of Westeros. That being said, there are some changes that still nag at fans of the book and, it would seem, at the man who wrote them as well. George R.R. Martin, author of A Song of Ice and Fire, recently posted an entry on his blog describing the myriad ways that the TV version of his fantasy epic messed up the Iron Throne, seat to the kings of Westeros. While Martin doesn't hate the HBO throne and admits that it's "iconic," he doesn't consider it a close enough match to the Iron Throne he described in his books. "It's not the Iron Throne I want my readers to see," said Martin. "The way the throne is described in the books... HUGE, hulking, black and twisted, with the steep iron stairs in front, the high seat from which the king looks DOWN on everyone in the court... my throne is a hunched beast looming over the throne room, ugly and asymmetric." The HBO versions "is none of those things." 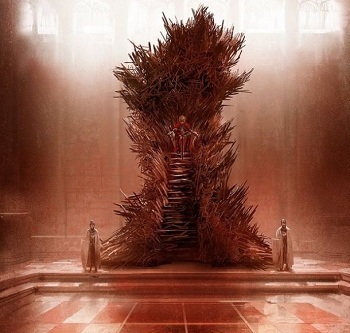 Martin would include in his blog post a painting by artist Marc Simonetti that he feels to be an accurate portrayal of the Iron Throne as he conceived it. "Marc has come closer here to capturing the Iron Throne as I picture it than any other artist to tackle it," said Martin. "This Iron Throne is massive. Ugly. Assymetric. It's a throne made by blacksmiths hammering together half-melted, broken, twisted swords, wrenched from the hands of dead men or yielded up by defeated foes... a symbol of conquest."